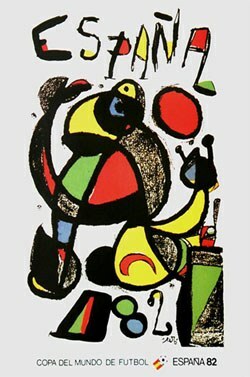 The twelfth World Cup was played in Spain from 13 June to 11 July. The final phase of the FIFA World Cup had expanded from 16 to 24 teams, which was natural due to the increase of participating nations in the qualifications (a total of 103 teams for the 1982 World Cup in comparison with 57 twenty years earlier). The enlarged proportions of African and Asian nations were especially noticeable (in 1994 FIFA decided to give yet another place to Africa). Argentina arrived in Spain as the reigning champions. The star of the previous tournament, Mario Kempes, was not in the same form. But a new young star was about to enter the world stage: Diego Maradona. Unfortunately for Argentina, Maradona’s skills were ramshackle by brute defending and in the end his revenge caused by frustration led to a red card. The set-up for the final tournament was a first phase with six four team groups – two teams from every group advance to a second group phase with four three teams groups. The group winners in the second phase would go on to Semi-finals. A novelty was that penalty-shootout was introduced to decide matches in the knockout phase that still not decided after extra time. The 1982 World Cup was played at 17 stadiums in 14 Spanish cities. 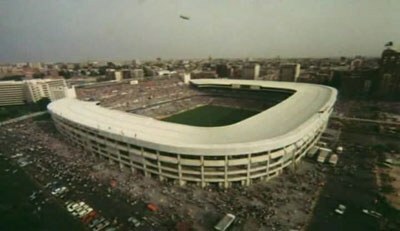 Although Nou Camp had the biggest capacity, the final was played at Santiago Bernabéu in Madrid. 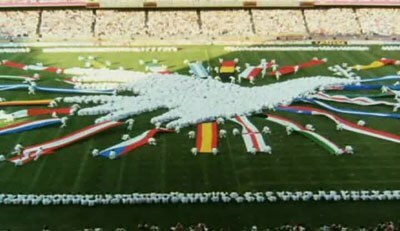 The 1982 included several sensations with underdogs that shook European giants. Cameroon didn't lose a single match, but was unlucky then Italy – the coming champions – by the slightest goal difference advance on Cameroons cost. Honduras managed to achieve a draw in their first match against the host nation Spain. Another astonish result was Algerians 2-1 victory against West Germany (that was one of the biggest favorites after winning the UEFA Euro 1980). Algeria would share Cameroon's destiny by being eliminated by goal difference. The ambitions of the home nation Spain was disintegrated by a mediocre team. After the half fiasco in the opening match, they probably haven't won the second match either if not the referee had given them a very dubious penalty and – after the penalty kicker missed – letting him take it again. The most entertaining teams were arguably Brazil and France. A fine edition of a Brazil (with players like Zico, Socrates and Falcão) would destroy Argentina’s chances to advance further, but after a somewhat sloppy loss against Italy, the Brazilians were also gone from advancing to the knockout stage. The less entertaining teams of Italy and West Germany would reach better results and would finally play for the trophy. The West Germany team would't exactly charm the football world. Especially the match against Austria was almost absent of initiatives, after an early goal, since both teams could play on the result and advance (the rule that the last two matches in the group were played simultaneously was still not implemented). Santiago Bernabéu before the final. The final has often been called the best World Cup game ever. Both teams include players of the highest class that today are placed in the football pantheon. In Brazil there was players such as Júnior, Sócrates and Zico and in Italy there was among others Dino Zoff, Marco Tardelli and Paulo Rossi. FIFA World Cup 1982 would include 52 matches in which 146 goals were made (2,80 goals per match). Five red cards and 100 yellow cards were shown during the tournament. The Italian goalkeeper Dino Zoff became the oldest player (40 years and 122 days) to win the tournament. Poland, Italy, West Germany, Austria, Belgium, Argentina, England, France, Northern Ireland, Spain, Brazil and Soviet Union succeed from first group phase into the second. Poland, West Germany, Italy and France would when winning their groups in the second group phase and advanced to the knockout stage. Italy would beat Poland and West Germany would beat France in the semi-finals. Poland defeated France in the third price match and Italy won the final against West Germany with 3-1. 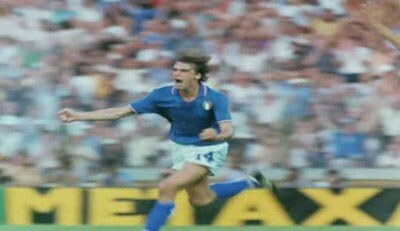 Tardelli's celebration in the final is a picture that stays in the memory.